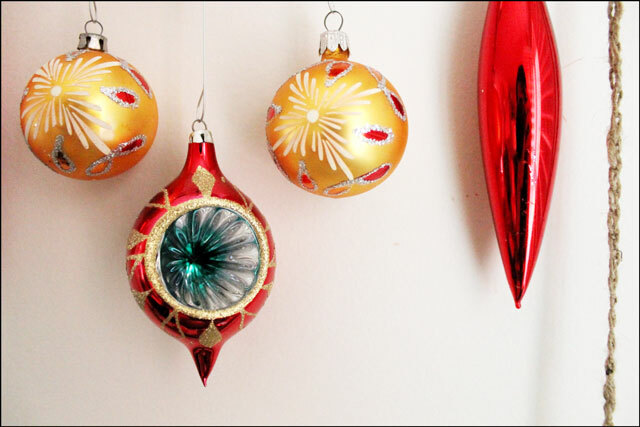 I have a soft spot for vintage Christmas ornaments, but we don't always put up a tree, so I try to come up with interesting ways to display them. 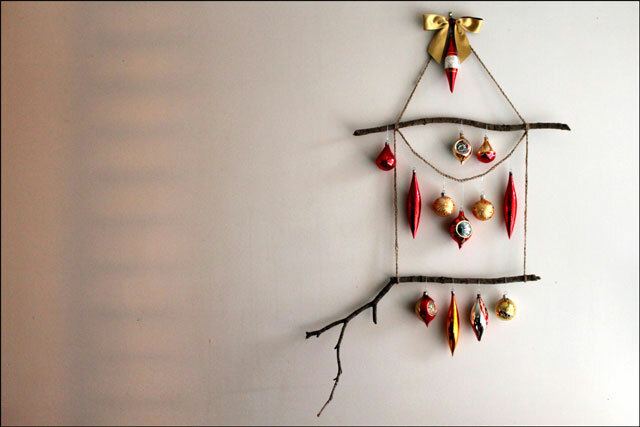 Here is a wall hanging I made, using branches and twine. It can be hung on the wall as I have done, or in a window or suspended from the ceiling. You could even make one for baby's room, and hang it over the crib. 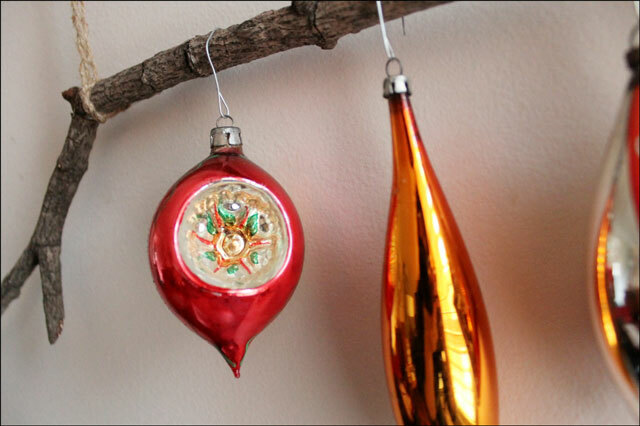 While I have shown it with my collection of delicate vintage red and gold ornaments, you can hang any collection of ornaments on it. 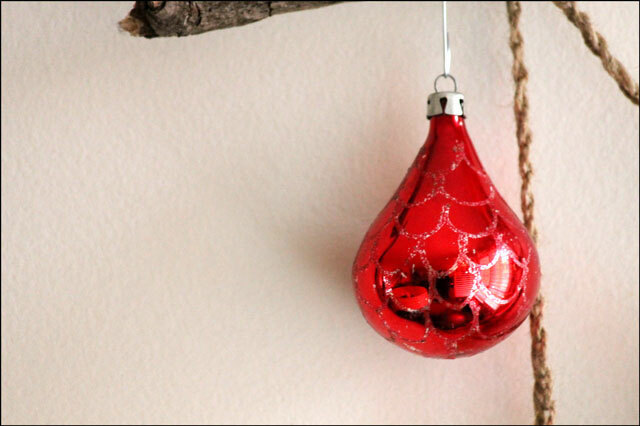 It is an easy way to bring a little festive decoration into any room in your home. 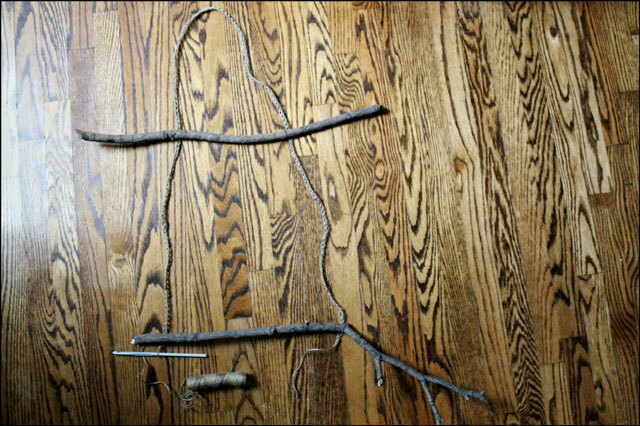 Supplies: Branches or dowels. Twine, yarn or thin ribbon. Crochet Hook (Optional). A bit of sticky tape. 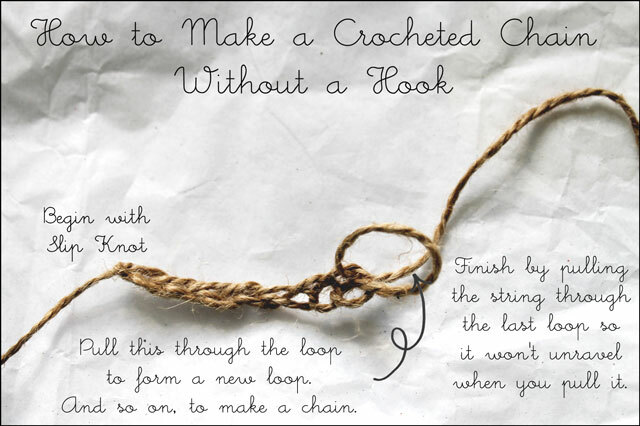 Make a chain with the twine, by crocheting it if you have a hook. The stitches will come out more evenly using one however you can also do it by hand (as shown in the accompanying illustration). 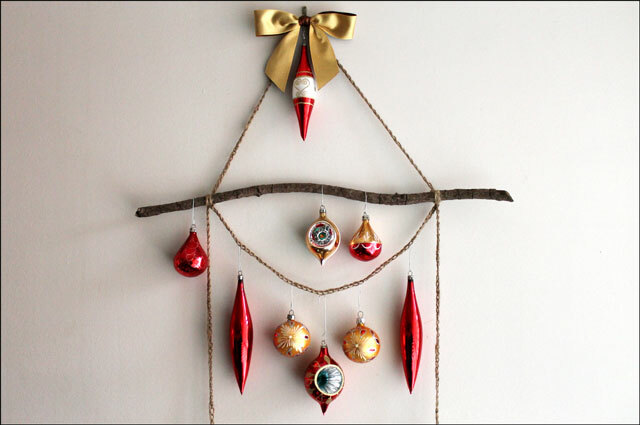 Then make a shorter chain, from which you will hang some of the ornaments. Leave ends of about 8 inches at either end of your chains, to use to tie them to the branches. Mine are 150 stitches long (about 56 inches), and 60 stitches (about 22 inches). But the lengths will depend on the size you want yours, and the pieces of branch you will be using. Measure while you work. Note that if you make your chain too long, it can easily be made shorter by pulling on the end. Once you are happy with the lengths, bind off by passing the end through the last loop of the chain. 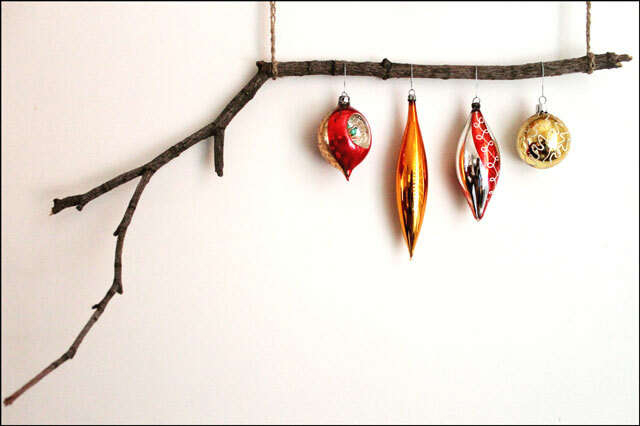 Tie the long chain to either end of the branch you will be using as your bottom piece. 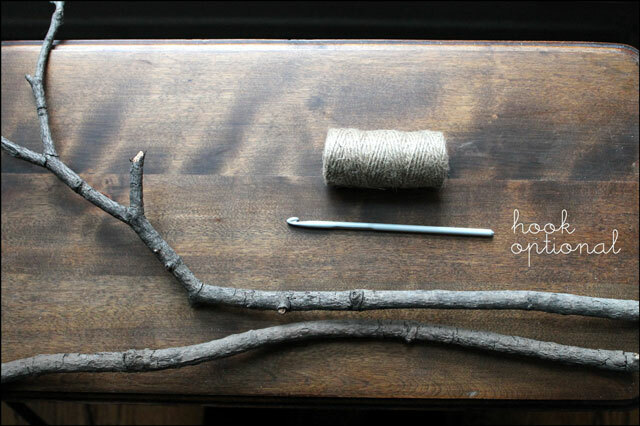 Then attach the second branch to the chain, tying it on with two 8 inch pieces of twine. Make sure to thread your twine right through one of the loops in the chain, so it doesn't slip down. 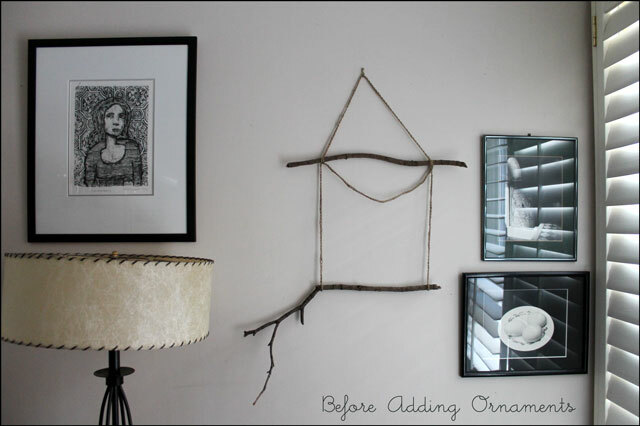 It might be easier to make it straight by hanging it on the wall while you measure where the second branch should go. Then tie your shorter piece of chain at the same spots that you attached that second branch. To hide your ends, gather them together and tape together (like the end of a shoelace), and clip any ends dangling beyond the tape. Hang it on a hook, and pull and stretch the chains so that the branches are straight. Hide your hook with a ribbon bow, if desired. 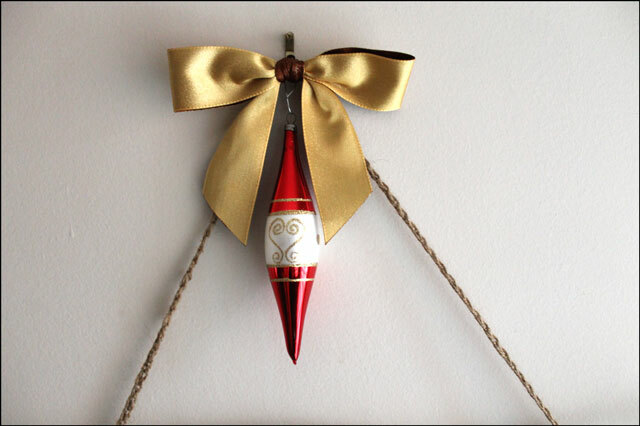 To hang your ornaments, use wire hangers and slip the hook right into the chain, so they don't slide around. Secure by pinching the wires shut, if your hanging will be placed in a spot where ornaments could otherwise fall off if jostled. 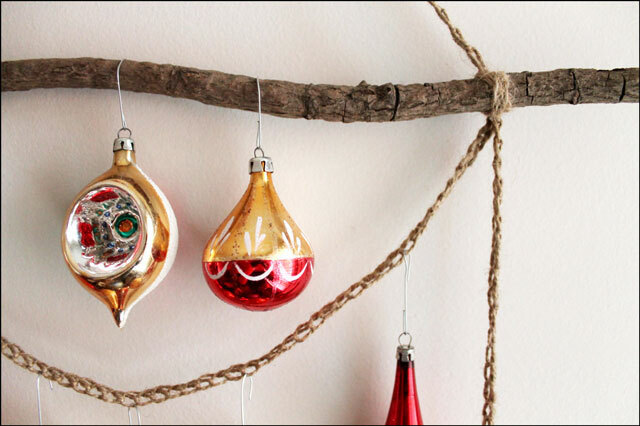 Hang some ornaments on the branches too, by bending wire ornament hangers to fit. I hope you make one and if you do, I'd love to see a picture. Thanks for checking out my diy. I am honoured to have you visit my site! You two and A Beautiful Mess are so inspiring. I LOVE this! Can I share a pic and link to this post on my blog? I’d also like to put it on Pinterest with your permission (linked to your blog of course.) I just love the way the lower branch extends down to the left. Quite a bit of artistry! I’m going to start scouring my brush pile! I am so glad you love it Jenny! By all means, certainly, share it however you would like. I appreciate you wanting to post about it. Yeah! I will probably post it on Monday, but will give you a heads up when I do. I could see this on the Design Sponge blog. I think it is wonderful. Thanks Vix. I began following your site at Christmas last year so this is an anniversary of sorts! It has been such a pleasure to see how your year unfolded. Your advent calendar turned out so nicely Jo. Hi Lisa! Yes this would be a good way to keep little curious people away from the ornaments, so that they will still be able to enjoy the same ones when they get older. Love love love this DIY! This is SO cute and something I’d love to make!! Hi Mandy. Thank you! I hope you do make one. It didn’t take me long at all … Under an hour to make, if you use a crochet hook. I’ve never seen this done before but I absolutely love it!! 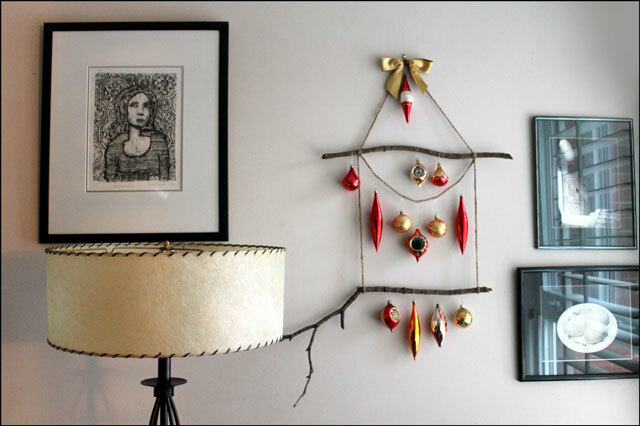 It’s a fabulous way to display ornaments that you love or have special stories behind. This looks really, really cozy and fabulous! oh wow, this is utterly stunning, and so original!! I love it!! Pinning it right now….. 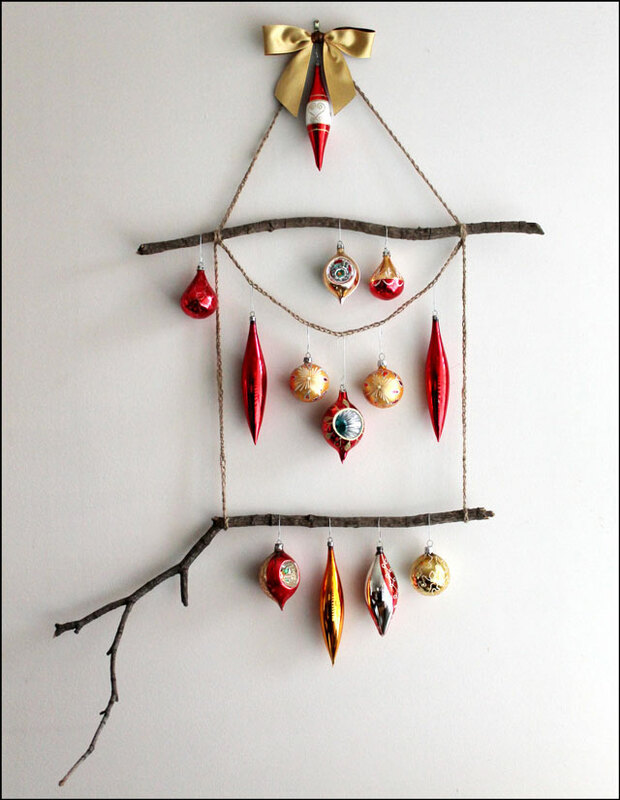 This is really clever and a very cute way to display ornaments if you don’t do a tree…or even if you do do a tree! whoa! such a great idea!